There are many ways to illuminate a room. You can purchase candles, floor lamps, overhead lights, track lighting, etc. In many cases, individuals purchase multiple types of light sources in order to gain more control over how much light is used in a room. 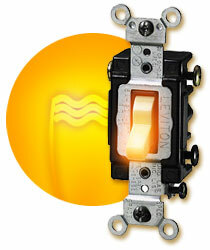 Your light sources, however, do not have to be so complex, gain complete control with a 3-way illuminated light switch. There are many varieties of 3-way illuminated light switches available for the consumer such as the Leviton 3-Way Lighted Toggle Switch, which provides the user the ability to light the room in three levels. There are no special light bulbs needed to utilize a 3-way illuminated light switch and the installation can be achieved by even the most unskilled do-it-yourselfers, as long as they can follow simple directions. The illumination that is ingrained in the switch provides a soft light when the actual switch is turned off creating an easy find solution for long dark hallways, basements, garages, and even children’s bedrooms. This feature saves many missed steps in a dark house without using the electricity required to keep a small lamp or nightlight in use. Using a 3-way illuminated light switch can save on your electric bill each month by allowing you to use less energy when used on the lower settings. Increase your savings by installing compact florescent light bulbs into your light sockets and feel good in the knowledge that you are lessening your ecological footprint.